Evgeny Morozov’s recent New Yorker article about Project Cybersyn in Allende’s Chile caused some controversy when critics accused Morozov of not fully acknowledging his sources. One of those sources was sociologist of science Andrew Pickering’s The Cybernetic Brain. Morozov is quoted as finding Pickering’s book “awful.” It’s unlikely that Morozov meant “awful” in the sense of “awe-inspiring,” but that was closer to my reaction after reading Pickering’s 500+ pp. work on the British tradition in cybernetics. This tradition was less militarist and more artistic, among other qualities, in Pickering’s account, than is popularly understood. I found myself greatly intrigued—if not awed—by the alternate future that his subtitle and final chapter announces. Cybernetics is now a largely forgotten dead-end in science. And the British tradition that Pickering describes had relatively little influence within cybernetics itself. So what is important about it now, and what is the nature of this other future that Pickering sketches? The major figures of this book, which proceeds with overviews of their careers, views, and accomplishments, are Grey Walter, Ross Ashby, Gregory Bateson, R. D. Laing, Stafford Beer, and Gordon Pask. Stuart Kauffman’s and Stephen Wolfram’s work on complexity theory also makes an appearance. Laing and Bateson’s relevance may not be immediately clear. Pickering’s interest in them derives from their extension of cybernetic ideas to the emerging technologies of the self in the 1960s. Both Bateson and Laing approached schizophrenia as an adaptation to the increasing “double-binds” of Western culture, and both looked to Eastern spiritual traditions and chemical methods of consciousness-alteration as potential treatments. The Bateson and Laing material makes the most direct reference to the connection between the cybernetic tradition and the “Californian Ideology” that animates much Silicon Valley thinking. Stewart Brand was influenced by Bateson’s Steps to an Ecology of Mind (183), for example. Pickering identifies Northern California as the site where cybernetics migrated into the counterculture. As a technology of control, it is arguable that this countercultural migration has become part of the ruling ideology of the present moment. Pickering recognizes this but seems to concede that the inherent topicality would detract from the focus of his work. It is a facet that would be of interest to the readers of this “Digital Studies” section of The b2 Review, however, and I will thus return to it at the end of this review. Pickering’s path to Bateson and Laing originates with Grey Walter’s and Ross Ashby’s pursuit of cybernetic models of the brain. Computational models of the brain, though originally informed by cybernetic research, quickly replaced it in Pickering’s account (62). He asks why computational models of the brain quickly gathered so much cultural interest. Rodney Brooks’s robots, with their more embodied approach, Pickering argues, are in the tradition of Walter’s tortoises and outside the symbolic tradition of artificial intelligence. I find it noteworthy that the neurological underpinnings of early cybernetics were so strongly influenced by behaviorism. Computationalist approaches, associated by Pickering with the establishment or “royal” science, here, were intellectually formed by an attack on behaviorism. Pickering even addresses this point obliquely, when he wonders why literary scholars had not noticed that the octopus in Gravity’s Rainbow was apparently named “Grigori” in homage to Gregory Bateson (439n13). I think one reason this hasn’t been noticed is that it’s much more likely that the name was random but for its Slavic form, which is clearly in the same pattern of references to Russian behaviorist psychology that informs Pynchon’s novel. An offshoot of behaviorism inspiring a countercultural movement devoted to freedom and experimentation seems peculiar. One of Pickering’s key insights into this alternate tradition of cybernetics is that its science is performative. Rather than being as theory-laden as are the strictly computationalist approaches, cybernetic science often studied complex systems as assemblages whose interactions generated novel insights. Contrast this epistemology to what critics point to as the frequent invocation of the Duhem-Quine thesis by Noam Chomsky. 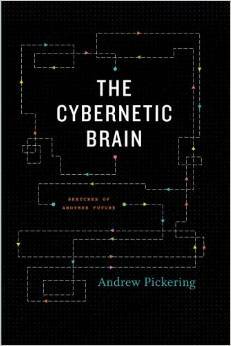 For Pickering, Ross Ashby’s version of cybernetics was a “supremely general and protean science” (147). As it developed, the brain lost its central place and cybernetics became a “freestanding general science” (147). As I mentioned, the chapter on Ashby closes with a consideration of the complexity science of Stuart Kauffman and Stephen Wolfram. That Kauffman and Wolfram largely have worked outside mainstream academic institutions is important for Pickering. Christopher Alexander’s pattern language in architecture is a third example. Pickering mentions that Alexander’s concept was influential in some areas of computer science; the notion of “object-oriented programming” is sometimes considered to have been influenced by Alexander’s ideas. I mention this connection because many of the alternate traditions in cybernetics have become mainstream influences in contemporary digital culture. It is difficult to imagine Laing and Bateson’s alternative therapeutic ideas having any resonance in that culture, however. The doctrine that “selves are endlessly complex and endlessly explorable” (211) is sometimes proposed as something the internet facilitates, but the inevitable result of anonymity and pseudonymity in internet discourse is the enframing of hierarchical relations. I realize this point may sound controversial to those with a more benign or optimistic view of digital culture. That this countercultural strand of cybernetic practice has clear parallels with much digital libertarian rhetoric is hard to dispute. Again, Pickering is not concerned in the book with tracing these contemporary parallels. I mention them because of my own interest and this venue’s presumed interest in the subject. The progression that begins with some variety of conventional rationalism, extends through a career in cybernetics, and ends in some variety of mysticism is seen with almost all of the figures that Pickering profiles in The Cybernetic Brain. Perhaps the clearest example—and most fascinating in general—is that of Stafford Beer. Philip Mirowski’s review of Pickering’s book refers to Beer as “a slightly wackier Herbert Simon.” Pickering enjoys recounting the adventures of the wizard of Prang, a work that Beer composed after he had moved to a remote Welsh village and renounced many of the world’s pleasures. Beer’s involvement in Project Cybersyn makes him perhaps the most well-known of the figures profiled in this book. What perhaps fascinate Pickering more than anything else in Beer’s work is the concept of viability. From early in his career, Beer advocated for upwardly viable management strategies. The firm would not need a brain, in his model, “it would react to changing circumstances; it would grow and evolve like an organism or species, all without any human intervention at all” (225). Mirowski’s review compares Beer to Friedrich Hayek and accuses Pickering of refusing to engage with this seemingly obvious intellectual affinity. Beer’s intuitions in this area led him to experiment with biological and ecological computing; Pickering surmises that Douglas Adams’s superintelligent mice derived from Beer’s murine experiments in this area (241). In a review of a recent translation of Stanislaw Lem’s Summa Technologiae, Pickering mentions that natural adaptive systems being like brains and being able to be utilized for intelligence amplification is the most “amazing idea in the history of cybernetics” (247). Despite its association with the dreaded “synergy” (the original “syn” of Project Cybersyn), Beer’s viable system model never became a management fad (256). Alexander Galloway has recently written here about the “reticular fallacy,” the notion that de-centralized forms of organization are necessarily less repressive than are centralized or hierachical forms. Beer’s viable system model proposes an emergent and non-hierarchical management system that would increase the general “eudemony” (general well-being, another of Beer’s not-quite original neologisms ). Beer’s turn towards Tantric mysticism seems somehow inevitable in Pickering’s narrative of his career. The syntegric icosahedron, one of Beer’s late baroque flourishes, reminded me quite a bit of a Paul Laffoley painting. Syntegration as a concept takes reticularity to a level of mysticism rarely achieved by digital utopians. Pickering concludes the chapter on Beer with a discussion of his influence on Brian Eno’s ambient music. 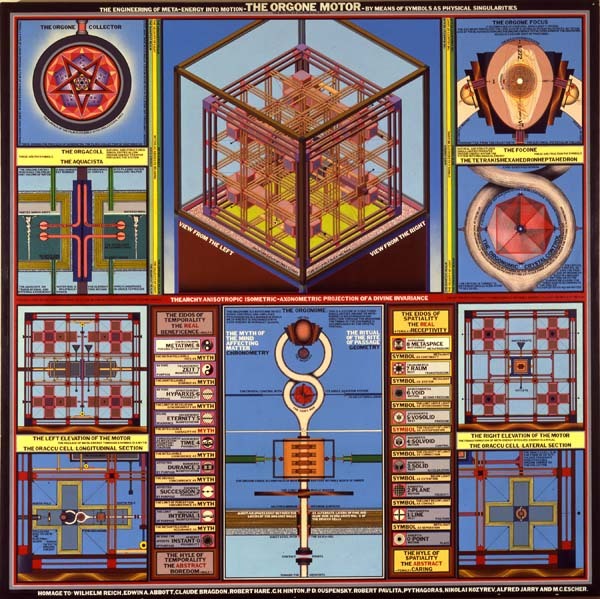 Paul Laffoley, “The Orgone Motor” (1981). Image source: paullaffoley.net. The discussion of Eno chides him for not reading Gordon Pask’s explicitly aesthetic cybernetics (308). Pask is the final cybernetician of Pickering’s study and perhaps the most eccentric. Pickering describes him as a model for Patrick Troughton’s Dr. Who (475n3), and his synaesthetic work in cybernetics with projects like the Musicolor are explicitly theatrical. A theatrical performance that directly incorporates audience feedback into the production, not just at the level of applause or hiss, but in audience interest in a particular character—a kind of choose-your-own adventure theater—was planned with Joan Littlewood (348-49). Pask’s work in interface design has been identified as an influence on hypertext (464n17). A great deal of the chapter on Pask involves his influence on British countercultural arts and architecture movements in the 1960s. Mirowski’s review shortly notes that even the anti-establishment Gordon Pask was funded by the Office of Naval Research for fifteen years (194). Mirowski also accuses Pickering of ignoring the computer as the emblematic cultural artifact of the cybernetic worldview (195). Pask is the strongest example offered of an alternate future of computation and social organization, but it is difficult to imagine his cybernetic present. The final chapter of Pickering’s book is entitled “Sketches of Another Future.” What is called “maker culture” combined with the “internet of things” might lead some prognosticators to imagine an increasingly cybernetic digital future. Cybernetic, that is, not in the sense of increasing what Mirowski refers to as the neoliberal “background noise of modern culture” but as a “challenge to the hegemony of modernity” (393). Before reading Pickering’s book, I would have regarded such a prediction with skepticism. I still do, but Pickering has argued that an alternate—and more optimistic—perspective is worth taking seriously. Jonathan Goodwin is Associate Professor of English at the University of Louisiana, Lafayette. He is working on a book about cultural representations of statistics and probability in the twentieth century. Wolfram was born in England, though he has lived in the United States since the 1970s. Pickering taught at the University of Illinois while this book was being written, and he mentions having several interviews with Wolfram, whose company Wolfram Research is based in Champaign, Illinois (457n73). Pickering’s discussion of Wolfram’s A New Kind of Science is largely neutral; for a more skeptical view, see Cosma Shalizi’s review. Bateson experimented with octopuses, as Pickering describes. Whether Pynchon knew about this, however, remains doubtful. Pickering’s note may also be somewhat facetious. See the interview with George Lakoff in Ideology and Linguistic Theory: Noam Chomsky and the Deep Structure Debates, ed. Geoffrey J. Huck and John A. Goldsmith (New York: Routledge, 1995), p. 115. Lakoff’s account of Chomsky’s philosophical justification for his linguistic theories is tendentious; I mention it here because of the strong contrast, even in caricature, with the performative quality of the cybernetic research Pickering describes. (1999). Though it is difficult to think of the Santa Fe Institute this way now. For a detailed cultural history of Project Cybersyn, see Eden Medina, Cybernetic Revolutionaries: Technology and Politics in Allende’s Chile (MIT Press, 2011). Medina notes that Beer formed the word “algedonic” from two words meaning “pain” and “pleasure,” but the OED notes an example in the same sense from 1894. This citation does not rule out independent coinage, of course. Curiously enough, John Fowles uses the term in The Magus (1966), where it could have easily been derived from Beer. Hayek’s name appears neither in the index nor the reference list. It does seem a curious omission in the broader intellectual context of cybernetics. Though there is a reference to Lem’s fiction in an endnote (427n25), Summa Technologiae, a visionary exploration of cybernetic philosophy dating from the early 1960s, does not appear in Pickering’s work. A complete English translation only recently appeared, and I know of no evidence that Pickering’s principal figures were influenced by Lem at all. The book, as Pickering’s review acknowledges, is astonishingly prescient and highly recommended for anyone interested in the culture of cybernetics.